The full spec of the Wii connector is not yet known, but so far we have the composite (AV), component, RGB and S-video pinouts, thanks to forum members RGB32E, dustinh2k and Scorpius. The image below was made by RGB32E, modified by NFG to reflect numbering by dustinh2k. An excellent step-by-step tutorial for making your own component cables was created by tkamen. * Luma/Chroma are the Y/C pins on S-video connectors. MODE pins: On PAL systems the default output is RGB + composite, on NTSC the default is S-video + composite. With pins 8 and 10 shorted, systems from both territories will switch to component video. Pins 14, 15 and 16 are used by the Japanese D-Terminal cable. They are confirmed non-functional on PAL consoles. According to Tak pin 13 is used by European RGB SCART cables to set 4:3 and 16:9 modes. According to BinaryProgrammer you can still use the composite video line while component is enabled. It's probably shut off when in non-interlaced/progressive mode. If you're hacking with paperclips, BinaryProgrammer suggests Acco #1 sized clips. All grounds are the same, none of them are better than others, none of them are for specific purposes, just convenience. Ground must be connected at least once on both ends of the cable! This is basic electronic theory, don't consider this an optional step. Scorpius revealed the RGB pinout for the PAL Wii. This has been confirmed by user Tak with the official RGB cable. 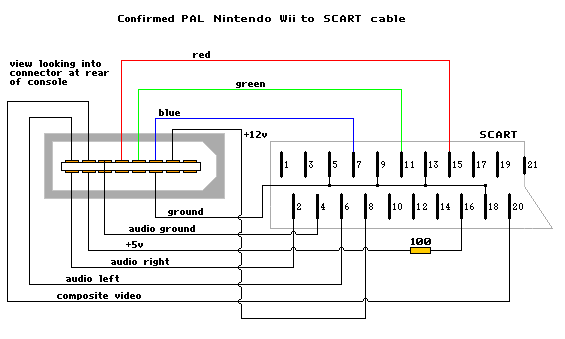 In this diagram (and, it should be noted, the official Nintendo RGB lead), SCART pin 8 (aspect ratio switching) is permanently connected to 12V. This will tell TVs that listen to this signal that the aspect ratio of the picture is 4:3 (as any signal between 9.5V and 12V will). If you have a suitable TV and want it to work at 16:9 by default, this pin needs to be brought down to between 4.5V and 7V (6V nominal). A voltage divider should probably be used for this purpose, but a single resistor will also probably work with a bit of information about the probable internal resistance to ground of SCART pin 8. This has been listed as >10Kohms, but how stable the actual value might be between different TVs is very difficult to say. Alternatively, of course, you could just use the 5V signal from pin 4 of the Wii connector. Information suggests (see section above) that Wii pin 16 actually contains information about the aspect ratio currently being provided, but the voltages present are not compatible (in magnitude or orientation) with those required for SCART switching to operate. NB: Since I wrote this, I have discovered that other experimenters are reporting that this pin does NOT alter its voltage in units of several regions - the conjecture is that it will ONLY operate as expected in Japanese units where the D-terminal cable is used. Unlike the GameCube, the Digital→Analogue Convertor (DAC) is inside the Wii, so enabling RGB on NTSC consoles will require some internal hacking (if it's possible at all). If RGB is available, VGA should also be, since VGA is just non-interlaced (progressive) RGB. The system is obviously capable of VGA-resolution output, the trick will be enabling RGB & non-interlaced at the same time. With some testing by user Scorpius and butter_pat_head, it seems that the Wii does not output digital audio (no S/PDIF or TOSlink). It might be possible that it can be enabled by software command or pin jumpering, but it is unlikely. It's possible, though unlikely, that there are additional mode pins enabling other outputs. See this forum thread for pics and discussion. Thanks to RGB32E, dustinh2k and acem77 for their work sorting this out.